12:15 PM CDT Quarter sized hail reported near Burkeville, TX, 60.5 miles N of Beaumont, TX, gas station in burkeville reported quarter size hail. 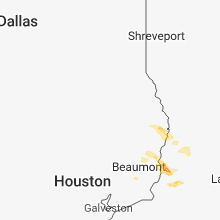 3:30 PM CDT Quarter sized hail reported near Vinton, LA, 12.2 miles ENE of Beaumont, TX, report from vinton police chief of quarter sized hail falling south of the interstate. roughly 2 miles se of vinton. 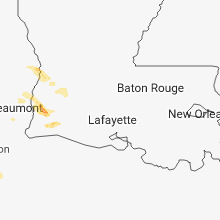 3:32 PM CDT Quarter sized hail reported near Vinton, LA, 12.2 miles ENE of Beaumont, TX, report from vinton police chief of quarter sized hail falling south of the interstate. roughly 2 miles se of vinton. 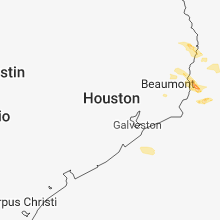 3:45 PM CDT Quarter sized hail reported near Sulphur, LA, 16.3 miles ENE of Beaumont, TX, social media post from local tv station of nickel to quarter size hail near choupique rodeo arena. time based on radar. 4:21 PM CDT Half Dollar sized hail reported near Sawyerville, AL, 60.4 miles NNW of Camden, AL, lots of hail fell. not quite the size of a golf ball. 4:46 PM CDT Quarter sized hail reported near Childersburg, AL, 30.9 miles ESE of Birmingham, AL, hail covering the ground. 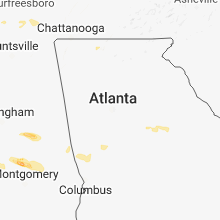 4:51 PM CDT Golf Ball sized hail reported near Childersburg, AL, 33.2 miles ESE of Birmingham, AL, hail covering the ground and roadways east of childersburg. largest hail was golf ball. 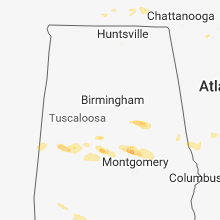 4:57 PM CDT Quarter sized hail reported near Sycamore, AL, 38.8 miles ESE of Birmingham, AL, hail covering the ground. 5:31 PM CDT Quarter sized hail reported near Maplesville, AL, 56.5 miles S of Birmingham, AL, quarter hail along highway 82. 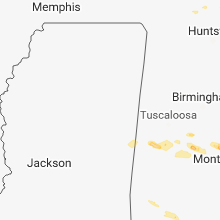 5:36 PM CDT Quarter sized hail reported near Titus, AL, 50.2 miles W of Auburn, AL, quarter-sized hail measured in the titus area. 7:50 PM CDT Quarter sized hail reported near Grove Hill, AL, 36.1 miles SW of Camden, AL, trained spotter reports quarter sized hail. report via spotter network and time estimated by radar. 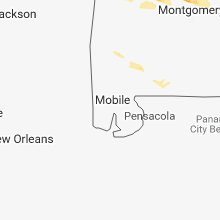 8:39 PM CDT Quarter sized hail reported near Monroeville, AL, 36.9 miles S of Camden, AL, multiple reports of quarter sized hail near frisco city... excel... and the monroe county airport. report via social media. 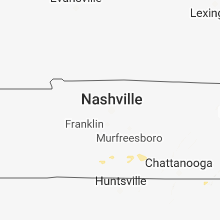 6:11 PM EDT Quarter sized hail reported near Chatsworth, GA, 34.1 miles SE of Chattanooga, TN, public reported quarter sized hail on ga-52 alternate.